This is actually a re-post from last October, but I made this dish over the weekend and wanted everyone to get a chance to see it again! It was just as good this year as it was last year. I found this recipe from Smitten's Kitchen blog, and knew right off the bat it was gonna be a winner in my book. A bit of a twist on traditional squash sweetened with honey/brown sugar and butter, this is a perfect accompaniment to roast chicken, which is exactly how I served it. Now, here's what I do differently. I also used a jalapeno pepper which is a bit milder than the red chili recommended. I would go with a spicier pepper next time, as you really don't use that much of it, and it really adds a distinctive flavor. I am thinking you are gonna love this!!! Sounds delicious, I love roasted vegetables. I continue to pray for you and your little grandbaby. Sounds delish!I too continue to keep you and your family in my prayers. Blessings to you. Praying for baby and family. I am so happy to hear the surgery went well. 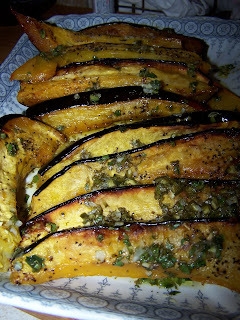 I made the squash recipe tonight after reading about it here. It is delicious! I actually made it for lunch tomorrow but ate half of it before coming to bed. Boy, this puts me in the mood for cooking for fall. Something about winter squash that makes you feel like you've snuggled in for the season. I love your blog... Link Exchange?? Thanks for sharing Cyn, Glad that Alex is home and doing well I am still praying for all. Thank you so much for this! We have about ten that we are storing for winter treats.